Nigeria President, Muhammadu Buhari on Wednesday in Abuja assured Nigerian youths that the ongoing anti-corruption campaign would secure the future of nigerian youth. 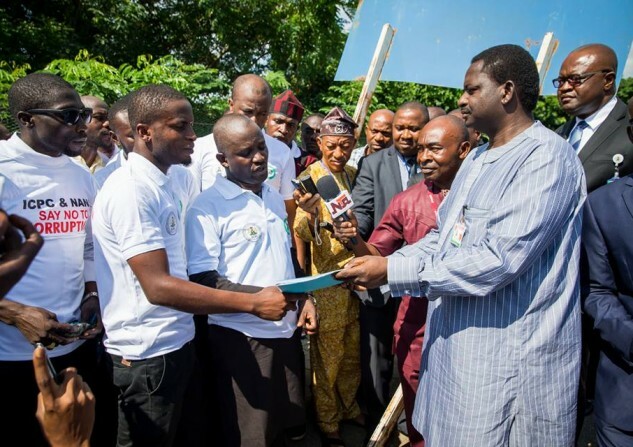 In an address to members of the National Association of Nigerian Students (NANS) who marched to the Presidential Villa to pledge their full support for his anti-corruption campaign, President Buhari who was represented by his Special Adviser on Media & Publicity, Mr Femi Adesina, promised that he will do his best to place Nigeria well on the way to becoming the nation of their dreams. “Everything you have asked for are the things that will make for a good country, and what we are after is a good country, a country where our youths can have a future and a hope. “The youths will feel it, the adults will feel it and old people will feel it and we will get the country of our dreams,” the President said. Mr. Adesina later received a document addressed to President Buhari from the NANS President, Comrade Tijani Usman Shehu, and he promised that the President will look into their requests. In his remarks, Shehu said the students were united against corruption, cyber crime, prostitution, human trafficking, drug abuse and other anti-social vices. “Nigerian students demand that our future must be secured and we strongly believe in the President’s zero tolerance for corruption,” Shehu said.